The name of Peter Closon is very well known to those who collect lantern clocks. He was one of the earliest and most prolific of all lantern clock makers, and his work is therefore well known. Yet little or nothing is recorded about his life beyond the dates when he is documented in the Clockmakers' Company records, including the details of the several apprentices he took through that Company. These were published in my book 'The Early Clockmakers of Great Britain' in 1982, but this was precious little knowledge about a maker, who ranks highly amongst the earliest lantern clock makers in Britain. The name Closon is not English. Sometimes spelled Closen or anglicised to Clauson or Clawson, it appears to originate in mainland Europe, principally France and the Low Countries, but it is also known in Denmark and Germany. It seems to me to have a French look about it. It seemed fairly clear that he either came directly here from mainland Europe or at least was of European extraction. This might explain why I had never managed to find any entries for him in the registers of English parish churches. He may of course have been a Catholic, in which case English records of Catholic births don't usually go back that far, and in any event his dates were quite early and the registers even of many Church of England parishes are not preserved so far back in time. Catholics usually married and baptised children in secret for fear of persecution and such records may never have been kept or were hidden so carefully as to have been totally lost. He may have been a Protestant and have belonged to one of the churches immigrant Protestants attended here. But even Catholics and immigrant Protestants would sometimes marry in a Church of England church, as I found that he did, for the same reason Quakers did this, that is to be able to prove legitimacy in case of a legal dispute about inheritance. A marriage which did not take place in church, though strictly still legal, was not easily validated and could be disputed in law. Peter Closon was one of the first 'subscribers', as they are called, who donated moneys towards the cost of the charter of incorporation of the Clockmakers' Company in 1630, which charter was granted by the King in 1631. The Company held its first meeting in 1632. Closon subscribed the surprisingly large amount of £5.00, one of only seven clockmakers to donate such a high sum. Only two people paid a higher sum, and that of a massive £10.00. These were Henry Archer, who was made the first Warden and deputy to the first master, David Ramsay, the King's Clockmaker since 1613, and 'Mr. Peteet', who was a Frenchman (Guillaume Pettit, usually written as William Pettit) and worked for David Ramsay. It is ironical that a Company formed to keep out 'foreigners' was headed at its inception by Ramsay, who was Scottish but had lived long in France, who was Master in name only and never did anything for the Company. To say he was a Royal favourite is a bit of an understatement. In 1613 Ramsay was sent for from France by the King, was made Royal Clockmaker at £50 a year, Groom of the Bedchamber at £26 a year, was given a 'pension' of £200 a year and in the one year of 1618 alone was paid £234.00 for work on the King's clocks! In 1625 he was granted shares of treasure trove in the county of Lincolnshire. In 1630 he was granted two parts of 'all pirate goods happening in Ireland for 21years', about which there was a great fuss 'the like never having been granted to anyone but the Lord Admiral'. In 1621 he was paid £150 for coins to be given the King on Coronation Day, in 1627 was paid £441 for clock maintenance, and in 1628 £415 for clocks. One of the strangest incidents was when he was given permission to attempt to discover hidden treasure in Westminster Abbey by using divining rods. Yet he paid not one penny towards the charter, scarcely ever bothered to attend meetings and when he did it was only for the purpose of awarding himself a grant from Company funds! William Pettit was a French 'boxmaker' (that is a watch case maker) who made the cases for watches sold with Ramsey's name on, and also received payments for work for her Majesty. He almost certainly came over from France with David Ramsay. The working clockmakers had to put up with the King's Clockmaker and his wealthy sidekick despite the Company's having been formed to prevent such abuse. It is possible even that Henry Archer was also French for his known work is French in nature. What Peter Closon's £5.00 contribution tells us is not only that he was already working at the lantern clock making trade in 1630, but also that he was in a pretty prosperous way of business. To practice a craft in London at that time it was pretty well essential for you to be a member of a City Company, and before the formation of the Clockmakers' Company that might be any company at all, not necessarily one which implied a connection with the craftsman's trade. I had long ago guessed that Peter Closon was a member of some other City Company before joining the Clockmakers, but which Company eluded me. Then, just recently, I learned from John Robey, who persisted with a line of enquiry I had tried long ago and had abandoned as fruitless, that he was apprenticed on the 20th April 1608 through the Clothworkers' Company to Henry Stevens. Stevens is a little-known maker of lantern clocks, his very existence known until recently through only two lantern clocks, now three. One is dated 1620 and has been owned by Merseyside County Museum for many years. Another is in the Clockmakers' Company museum. A third, which was converted later to a spring-drive movement, came to light only recently (2008) at auction. We now know Henry Stevens was born about 1577 and is believed to have died in 1638. 1. A classic pre-Civil War lantern clock dating from the 1640s. 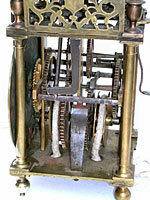 It was made with balance wheel control, modified later to anchor escapement and long pendulum. Click for closer view. From all this we can calculate that Peter Closon was born about 1594 and would have been free to trade from 1615. That was a good start. I did manage to discover that he was married on the 25th June 1629 at St. Mary Mounthaw church in London to Margaret Buckner, a name which we shall see again later. Peter Closon may have come from a Catholic family, but his wife certainly did not. When I got well and truly bogged down with Peter Closon's ancestry I turned instead to look at that of his wife, and came up with one or two surprising results. Eventually by roundabout means I learned that Peter Closon was the brother of William Closon, a gunmaker of Southwark, and of Paul Closon, also a gunmaker, of Whitechapel. They were all three sons of Godfrey Closon, himself a gunmaker of Whitechapel, who also owned property in Southwark, and who died about 1616. William, who was probably the elder son, took over the Southwark premises; Paul, probably the second son, worked in Whitechapel; Peter, the youngest son, set up near Holborn Bridge. The kind of guns the Closons made, were, I suspect, cannons for ships and military purposes. Whatever kind they were, they would certainly have been involved in the founding and casting of brass and other metals, and there is some evidence that Peter Closon may have performed his own brass casting, at least for part of his working life. George White has recorded (English Lantern Clocks) what he took to be the initials PC inside a shield, which may be Peter Closon's own casting mark. Peter Closon became an Assistant in the Clockmakers' Company in 1633, Warden from 1637-39, after which date he bound several apprentices in the Company through other freemen. In fact he never progressed to become Master of the Company. We have precious little information on Peter Closon's life other than what emerged through a knowledge of the families of his two brothers and through his connections with his apprentices. These apprentices are illuminating as some were known nonconformists, some were relatives of his wife, some were connected with his brothers .... Time and time again we find that connections between clockmakers came about because of family relationships rather than by chance happening. His first apprentice was John Wise, whom he took in 1638. Wise was born in Banbury, a cousin-to-be of the yet-unborn Joseph Knibb. Wise was made free in October 1646 and within a short time went to work in Warwick till about 1668, when he returned to London. In 1664 Wise was noted as a nonconformist, a possible source of connection with Closon. In 1639 Peter Closon bound Nicholas Tomlins as apprentice, who was freed in October 1646. Tomlins is believed to have died in 1658 aged only 33. He is believed to have worked throughout as part of the Peter Closon workforce and no clocks are known in his own name. The odd thing is that in August 1646 Nicholas Tomlins was a witness to the will of Peter Closon's brother, William Closon, the gunmaker in Southwark. Peter Closon worked near Holborn Bridge, his brother, William, over on the south bank of the River Thames at Southwark, just about as far apart as you could imagine. What Nicholas Tomlins was doing living and/or working in William Closon's household across the river when still an apprentice to Peter is a mystery. Maybe he was learning the craft of casting brass. Had Peter just lent him out to assist his brother, who in his own words described himself in August 1646 as in 'reasonable health of body & of perfect memory, thanks be given to God for the same, yet considering the frailty of human life espetially of old age to which by God's mercy & long sufferance I have obtained'. Peter himself was then aged about fifty two. At a guess William would have been at least sixty five, possibly much older, but seemingly he was very frail and in fact he was dead before Christmas of that year, barely five months later. Strangely enough another witness to William Closon's will in August 1646 was Thomas Milles, who was probably the clockmaker of that name known through half a dozen fine lantern clocks. He is believed to have been the son of William and Peter Closon's sister, who had married a Mill(e)s, in other words, William and Peter Closon's nephew. Thomas Milles joined the Clockmakers' Company in 1652, but was known to them and binding apprentices through them from late 1646, quite contrary to the rules. Even though Thomas Milles may have been a freeman of some other company, he did not become a free Brother of the Clockmakers till 1652. Was Thomas Milles also working at that time for William Closon, perhaps having been apprenticed to him earlier as a gunmaker? Or was he just visiting his sick old uncle who happened to be writing his will when he dropped in? 2. 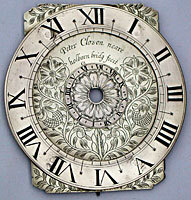 The engraving on these early dials is two-dimensional and rather primitive and the hour numerals tend to be squat. This clock is signed 'Peter Closon neare Holborn bridg fecit'. Click for closer view. Southwark was notorious for being a district which lay pretty well outside the control of the City Companies, whose powers to regulate who should trade and who should be an apprentice were more or less confined to the city. In theory the Companies had control south of the River Thames, but not so in practice. This made this area one where foreign craftsmen tended to congregate, who were not permitted to trade in the city, and also where lads could be taught a trade without an official apprenticeship. The result being that Southwark had a high percentage of immigrant craftsmen and a very large apprentice population. Could this explain why Nicholas Tomlins and Thomas Milles were working there? Peter Closon's other apprentices were Robert Cosby, taken in 1646, Hugh Cooper taken that same year, Richard Ames taken in 1649, William Speakman taken in 1654 through Nicholas Tomlins (his own workman?) and freed in 1661, then William Fenkman (a very unlikely name and probably a clerical error for William Speakman), in 1657 Humphrey Clark, then in 1660 Philip Buckner. Philip Buckner was Peter's wife's nephew - born 1642, the son of William Buckner, brother of Peter's wife, Margaret Buckner. He was the last apprentice Peter Closon took, and before Philip had completed his seven years, Peter was dead. We know he was still alive in 1660, when Philip Buckner was bound apprentice and we know he was dead by 1662, when his name fails to appear on a list of clockmaker drawn up as a sort of census by the Clockmakers' Company. But so far I have not located his burial. Peter Closon's wife was Margaret Buckner and she seems to have been born in 1602, the daughter of Thomas Buckner of Reading, Berkshire. Now Thomas Buckner appears also to have had interests in London, and, oddly enough, a witness to the will of Paul Closon of Whitechapel in 1646 was Thomas Buckner. Could this be the Thomas Buckner, who was the father of Peter Closon's wife, Margaret? Time and again these people seem to be linked together by family relationships. The year 1646 was a tragic one for the Closon family for not only did Peter's older brother, William, die then, but so too did his other brother, Paul Closon, the gunmaker at Whitechapel. Paul Closon made his will in November 1646, when his brother William was on his deathbed, and Paul himself was 'weake and ill in body' - in fact he died within two months. The reason the two older Closon brothers made their wills at this time when the end was nigh, was probably to do with inherited property. Amongst the properties left by their father, Godfrey Closon, were some in which each brother had a third share, in particular a large premises known as the 'Bear's Foot'. In his will William explains that they had shared out the other properties equitably between the three of them, but for this one in which they had a one third share each. Both William and Paul clarify the ownership of that share in their respective wills, acknowledging the share their brother, Peter Closon, held. This Bear's Foot property passed down to the descendants of William and Paul, but as far as I can see, Peter had no descendants and left no surviving children. Peter Closon was a prolific maker of lantern clocks. Over a score of his lantern clocks are illustrated in the standard literature of horology. His style varies considerably, as we might well expect, since he made clocks from about 1615or 1620 till about 1662, a period of over forty years. With very few exceptions they were made as balance wheel clocks, though most were modified later to one form or other of pendulum control to improve timekeeping. At least two lantern clocks are known by him made originally with pendulum control. As the first pendulum clocks were not advertised for sale by Ahasuerus Fromanteel till 1658, we can assume that these two clocks date between 1658 and 1662, after which we have no record of Peter Closon. This suggests that although he was aware of the new pendulum control and tried his hand at it, he did not adopt it for general use. Like other clockmakers of the day he was content to continue to produce the same kind of balance wheel lantern clocks as formerly. We do not know why this was. However we can guess that with production systems set up for balance-wheel clock making, they were easier to make and we do know they were less costly. 3. The movement from the right. Note the strong taper on the original arbors. The hammer spring and stop and very plain on some early clocks. Click for closer view. Of the forty-six 'original subscribers', who contributed monies towards the cost of the charter of incorporation, the great majority were makers of watches. In fact the list of subscribers totals 51 names, but five names were written in twice, presumably in error. Only six of them are known to have made lantern clocks. Four of those are known for a very small output, either because they made lantern clocks only very occasionally or because their working lives were short - Francis Foreman is known through only five lantern clocks, Samuel Linaker through only one, David Bouquet through two or three and Thomas Howse through only one, though watches are known by most of these. Of the forty six subscribers only two made lantern clocks in any quantity and these two were William Bowyer and Peter Closon. These two were THE lantern clock specialists and as far as I know no watches are known by either of them. There were a handful of others who were already out of their apprenticeships at the time (1630) and who made lantern clocks but did not subscribe to the charter and these can be briefly summarised as follows. Only one solitary example of a lantern clock is known from each of the following: Henry Ayers working 1628-33, John Cattle, working 1629-35, Henry Dunn, working 1630-78, John Gilson, working 1628-32, and Richard Child, working 1629-c.1650. Henry Stevens, working 1577-1620, is known through three. John Harvey, working 1578-1602, is known through no example, though his son, Robert Harvey, working 1588-1615, is known through two examples and his other son, Thomas Harvey, working 1615, through a just one. The reason few clocks are known by these men is either because they were only occasional makers of lantern clocks or because their working lives were brief or because of the high rate of destruction of their clocks by virtue of their sheer age, or a combination of all these factors. John Pennock, a former apprentice of John Harvey, was a more prolific producer working 1629-73 and is known through nine or ten lantern clocks. But THE two major producers of lantern clocks who were working by the time of the charter were William Bowyer, working from at least 1616 till about 1655, and Peter Closon, working from 1615 to 1662. It may well be that Peter Closon's business was continued from about 1660, perhaps after his death, by Richard Ames, his former apprentice. Ames too specialised in lantern clocks, which he signed 'near St. Andrews Church in Holborn', which was exactly where Peter Closon had worked. Ames also specialised very much in lantern clocks with a verge pendulum swinging between the trains, a type Peter Closon had been one of the first to experiment with. If Richard Ames did succeed him, this further implies that Peter Closon had no son to succeed him in the clock trade. This seems to be a rather sad end to a career for one of the most important lantern clock makers of all time. Details of his birth still elude us, and of his death. So the research continues, and who knows what more waits to be discovered.